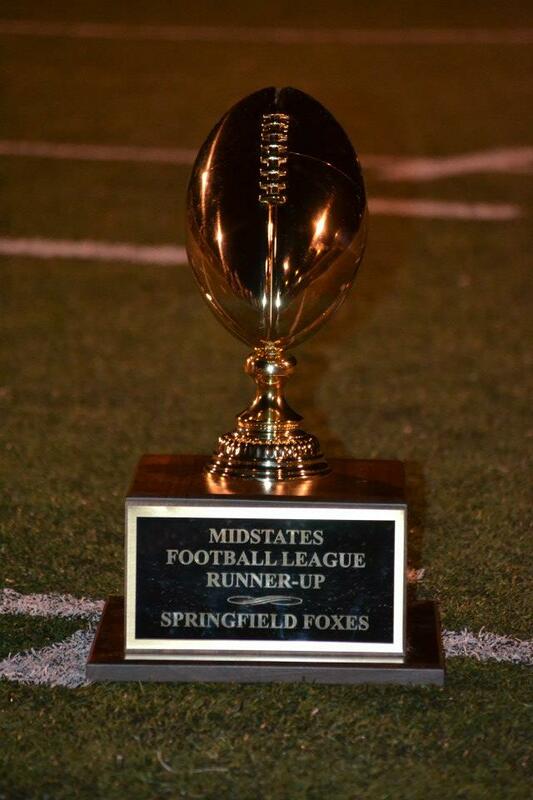 Springfield Foxes semi-pro football team of the MidStates Football League. 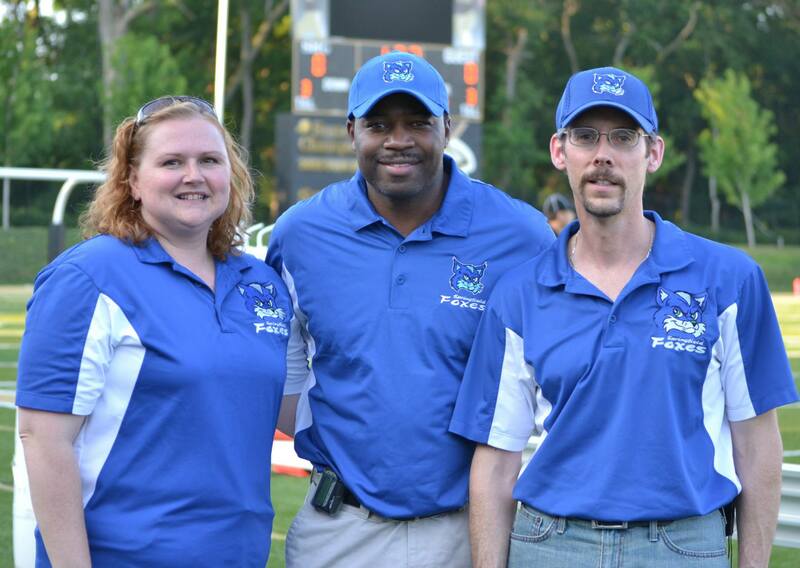 During the 2011 & 2012 seasons, Dr. Todd & Eugena also served as Head Trainer & Assistant Trainer respectively. For the 2013 season, while Dr. & Mrs. Austin will still help out with training duties as needed, they are excited to announce the addition of Saadiq El-Amin, M.D. (orthopedic surgeon), Donald Carson, D.O. 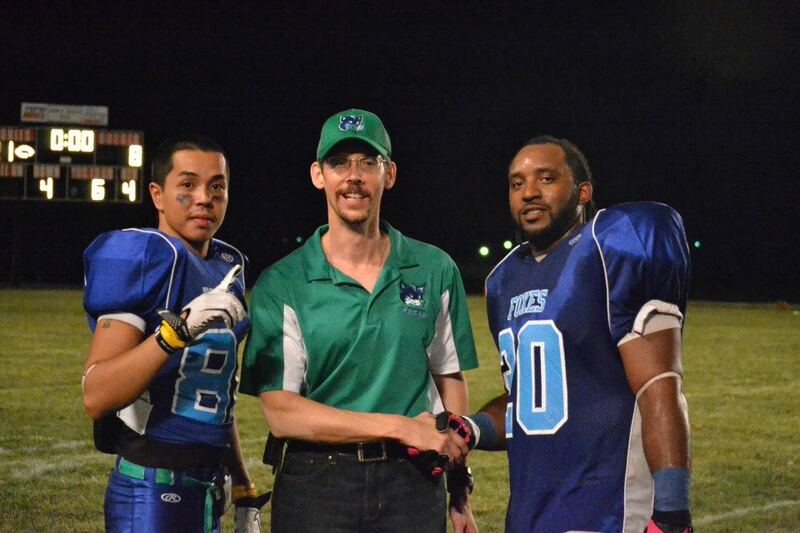 (sports medicine resident) and Wendell Becton, M.D. 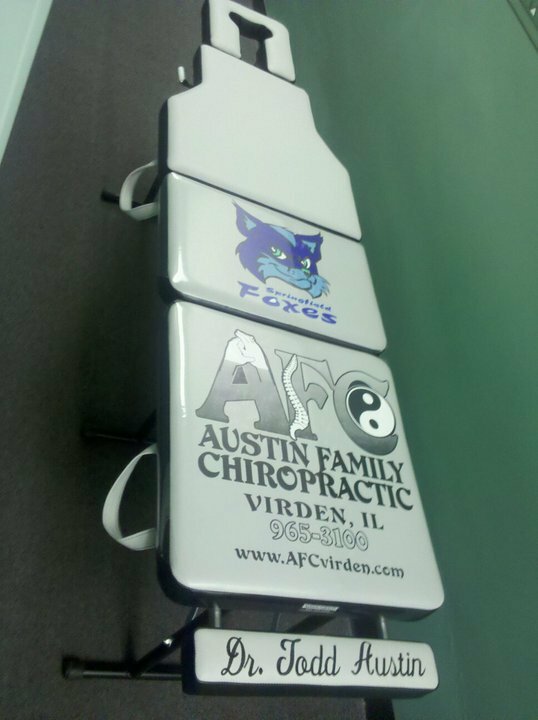 (non-surgical orthopedist) to the Foxes sideline healthcare staff as well. For Dr. Todd Austin's Interview about 'Being a 2013 SPRINGFIELD FOXES Team Physician' video, please click here. 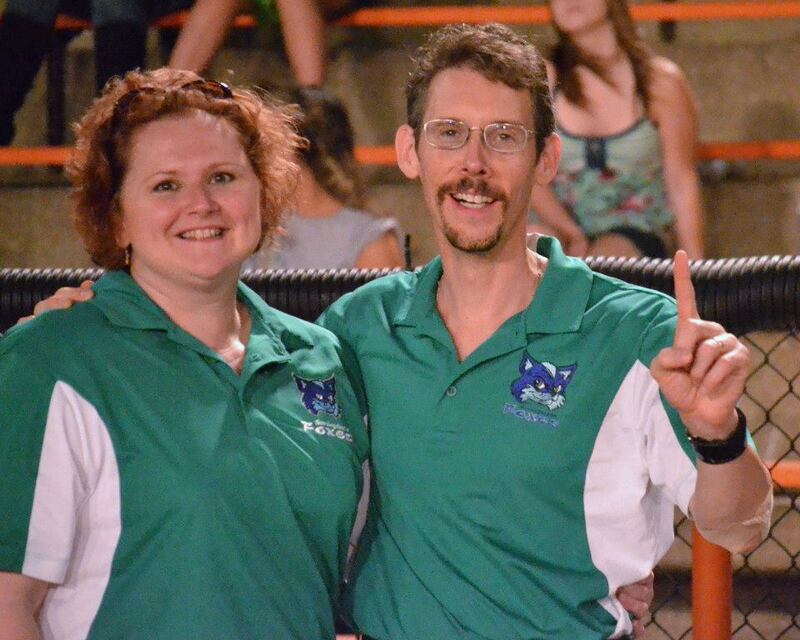 Both Dr. Todd & Eugena have assisted on the sidelines for the Springfield Foxes since the 2011 season. The Foxes are a semi-pro football team. 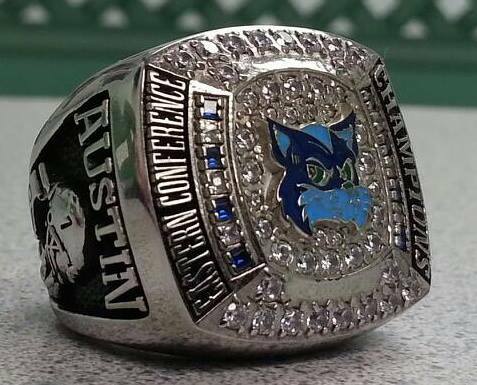 They are the 2012 Northeastern Division Champs as well as the defending Eastern Conference Champions of the Mid States Football League. All Foxes home games are played on Saturday nights at beautiful S.H.G. Stadium in the 'Capital City' of Springfield, IL during the months of July, August & September. Thanks to all of our wonderful FOXES NATION fans for making our inaugural (2012) campaign at SHG a historic one! 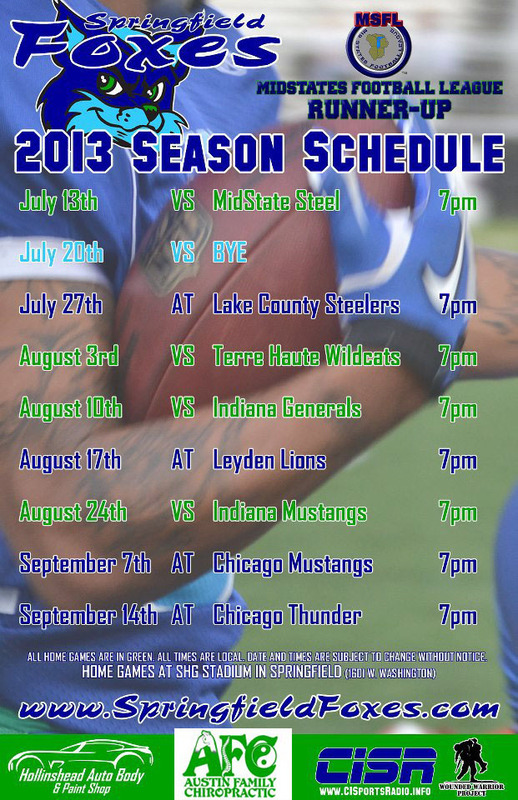 Please plan to attend some Foxes regular season and playoff home games in 2013 as well. Support a local team and it's many sponsors. 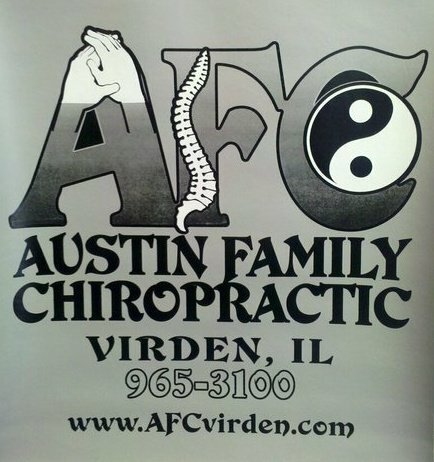 And catch Dr. Todd & Eugena in action as sideline chiropractor, sideline massage therapist and team trainers. Of course, if your business would like to be a sponsor, please contact the Springfield Foxes directly and ask for Jake. On 10-6-12, the Foxes represented the EASTERN CONFERENCE of the MidStates Football League (MSFL) in the Championship Game vs. the Racine (WI) Raiders at Joliet Memorial Stadium. Although the Foxes gave it a valiant effort, they came up just a bit short by a score of 49-44. Congrats to the Racine Raiders on being the 2012 MSFL Champions. Congrats to the Foxes on being the runners-up as well! 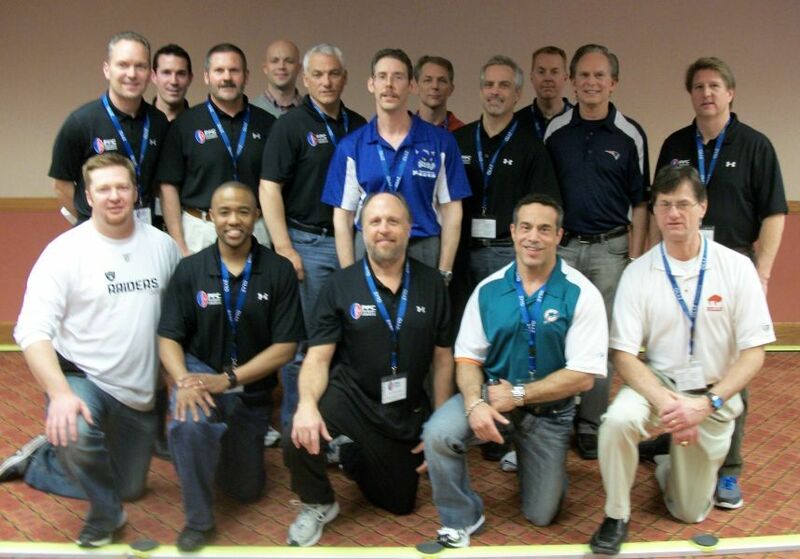 News release about Dr. Todd & Eugena working with the SPRINGFIELD FOXES in 2012. 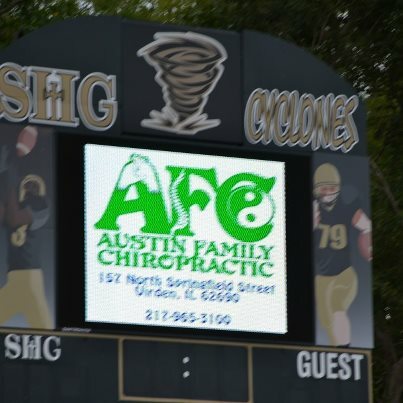 Dr. Austin is an "Associate Member" of the Professional Football Chiropractic Society. Here are all scores from a tremendous 2012 Foxes campaign. 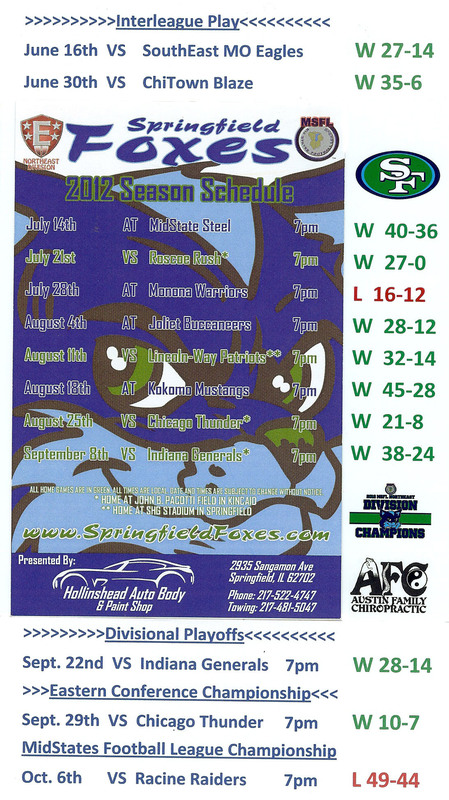 The SPRINGFIELD FOXES look to defend their Eastern Conference title and make a push for an MSFL Championship beginning on 7-13-13.
show called "THE FOX HOLE". Stay tuned for more details.